For more details, please visit MusicCast special site. MusicCast employs a high performance wireless network to deliver music and audio enjoyment. It can stream digital music content from your smartphone, PC or NAS to other MusicCast devices in your home. It can also share the music from external devices such as a TV or BD player connected to the YSP-1600. Audio content from Bluetooth-connected smartphones or tablets can also be streamed to MusicCast devices in multiple rooms. Yamaha’s unique Digital Sound Projector technology achieves actual (not virtual) surround sound in your home theatre. Eight 2.8cm (1-1/8”) high quality array speakers create beams of sound that are precisely time- and direction controlled using digital signal processing. The sound reflects off the walls, enveloping you in true surround sound. Beam positions can be adjusted using the remote control or a smartphone app, allowing many people to enjoy the realistic, expansive sound. The slim body makes it extremely easy to position the unit in front of a TV, ensuring that the screen is not blocked. The 76W digital amplifier, eight beam speakers and two built-in subwoofers produce truly high quality surround sound from your TV, smartphone or other source. Two upward-facing powerful 8.5cm (3-1/4”) subwoofers are built into the ends of the unit. Combined with the bass reflex port and wide, large volume body, the SRT-1600 will deliver clear, deep and expansive bass to enhance the enjoyment of movies and music. Yamaha’s ultra-sophisticated Cinema DSP technology creates thrillingly realistic soundscapes in any room. You can use the app to select five different programmmes: Movie, Music, Sports, Game or TV programmes. The Subwoofer Out jack lets you connect an additional subwoofer to enjoy even more powerful bass sound. The YSP-1600 is compatible with a free controller app for iOS and Android. The easy-to-see and easy-to-use operating screen uses icons to let you easily perform a variety of operations while watching your smartphone or tablet screen. 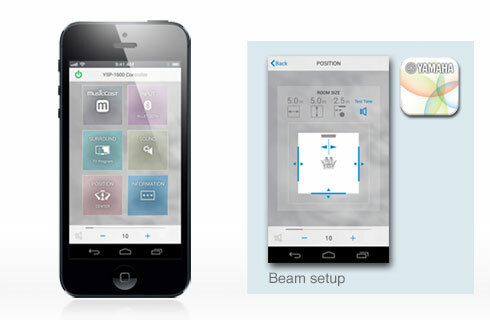 You can also make detailed settings for the beam sound output. Enjoy music from your smartphone or tablet wirelessly using a Bluetooth connection. You can also use the convenient AirPlay function for wireless music streaming from iPhone or iPads. In addition, a Bluetooth standby mode provides the convenience of having the YSP-1600 turn on and off automatically. The YSP-1600 is equipped with the latest Bluetooth technology, making wireless operation more convenient than ever. You can stream music from the YSP-1600 to Bluetooth headphones for private listening or to Bluetooth speakers. The YSP-1600 completely supports the latest HDMI standards. 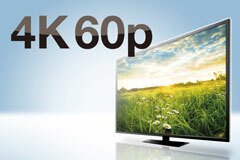 Thanks to transmission of 4K video at 60 frames per second pass-through, you can fully enjoy the high definition video quality of 4K without degradation. It also adheres to the HDCP2.2 copyright protection standard for 4K video transmission.